Woodlands Award Winnng Guest Accommodation is a modern Bed and Breakfast only minutes walk from the village of Oughterard. 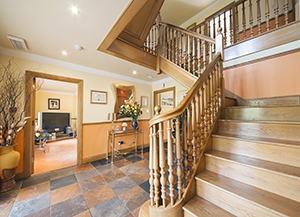 We are members of the Family Homes of Ireland Bed and Breakfast Association. Our location makes the perfect base to head out to see Connemara, the beautiful Maam Valley and Clifden. Even closer to home there are many activities including, hill walking, fishing, horse riding and we are only a very short distance from Oughterard Golf Club. Woodlands B&B are committed to making you feel at home and provide home baking upon arrival as well as shampoo, conditioner, bubble bath and soap in every room. We also provide a selection of breakfast items on our menu. Our 4 star B&B also accepts credit cards, for your convenience. We pride ourselves on offering a friendly easy-going atmosphere where your needs are paramount. If you have any special requirements or would like advanced organisation of any activity of interest then please lets us know and we would be only to happy to arrange this for you.